There’s a shark on the runway. No, it’s not some nightmare scenario brought about by severe flooding, but a real-deal Embraer E190-E2 aircraft, painted up in a special great white shark livery. In recent months, this ferocious flier has been turning heads and starring in travelInstagrams from the Maldives to South Africa while on a world tour and in October, it was spied at Nepal’s Kathmandu-Tribhuvan International Airport following a fly-past of Mount Everest. Nicknamed the Profit Hunter, this is the show plane for Boeing and Embraer’s E2 family of regional jets, which encompasses the E175-E2, E190-E2, and E195-E2, and it’s stealing some of the attention that’s lately been lavished on its competitor, the Airbus A220. The A220 series was originally created by Canadian manufacturer Bombardier as the C Series, with the first jets off the line sold to Swiss International Air Lines, which has been flying them since 2016. AirBaltic became the second C Series operator in late 2016, and Korean Air took delivery of its own in December 2017, with Delta also placing orders and planning to commence regular A220 flights in 2019. However, it was in October 2017 that Airbus announced a partnership with Bombardier, which evolved into a majority stake in the manufacturer and a rebrand of the C Series to A220 during the Farnborough Airshow in July 2018. The rivalry between the Embraer’s E2 series and the Airbus A220 reached its zenith at Farnborough, when JetBlue Airways ordered 60 A220s over the E2s, to replace its Embraer 190 fleet. First deliveries of these aren’t expected until 2020, but for travelers who have come to know, and perhaps love, the smaller aircraft of the JetBlue fleet (the airline currently only operates Airbus A320s and Embraer E190s), the change to Airbus A220s means losing an overlooked amenity that’s a trademark of Embraer: no middle seats. Embraer’s country-hopping world tour is the Brazilian aircraft manufacturer’s chance to demonstrate to clients, as well as to the traveling public, that it has new aircraft too, and with technical and comfort advances developed since the early 2000s introduction of the first E-jet generation, of which more than 1,400 currently fly for operators around the world. 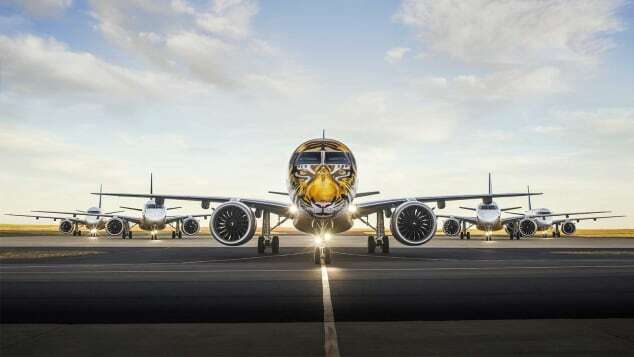 The plane debuted in February with this tiger-themed livery. So what are those advances, specifically? Although details like legroom and seating configuration are decisions left to each airline customer, the new-generation aircraft offer some guaranteed benefits for passengers, like re-designed windows with larger frames to make the cabin brighter, overhead bins that are 40% larger and able to fit standard carry-on luggage wheels-first, and no under-seat support rails to impede legroom. Even though travelers may feel as though they’re flying in a larger plane, there’s one distinct feature that is undeniably Embraer, and which will continue with the E2 jets: the absence of middle seats. Not even the most miserly airlines can wedge middle seats into these aircraft; the configuration will be 2-2, with passengers assigned to either a window or aisle. Embraer even offers a premium cabin option of staggered seats, with the aim of increasing privacy and eliminating shoulder-to-shoulder squish. On the technical side, improved fuel efficiency and reduced emissions are major selling points, and made possible thanks to a completely new, high-aspect-ratio wing design. The aircraft are also lighter overall, due to utilization of the latest fly-by-wire technology. 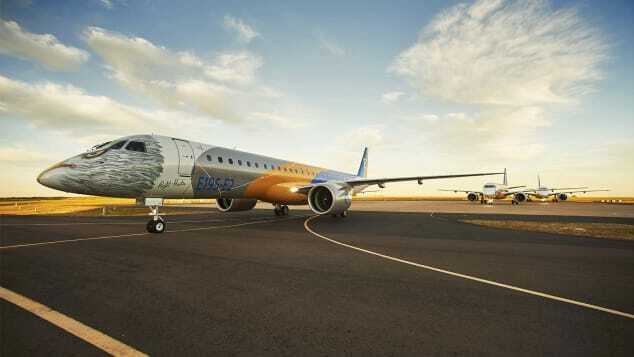 While the shark-snouted plane continues its world tour, Embraer E2 jets with less showstopping paint jobs are already entering into regular passenger service. There’s an E195, the larger version of the E190, with an eagle theme. The first E190-E2 was delivered in April to Scandinavian Airlines’ regional subsidiary, Widerøe, and the airline is now flying three of the type around Norway. The largest E2 customer is SkyWest, a regional airline affiliate flying for the likes of American Airlines, Delta, United and Alaska Airlines. Their order, the first placed when the E2 program launched at the 2013 Paris Air Show, is for 100 of the smallest E2 jet, the E175-E2, which can carry 80-90 passengers, depending on configuration. This means the new E2 jets will surprise passengers in the States with more spacious interiors, larger overhead bins, and that “new airplane smell” US regional jets lost long ago — albeit not until 2021 when the first E175-E2 orders are scheduled for delivery. FlightGlobal reports that Embraer has also highlighted Alaska Airlines, Spirit and United as the US carriers most likely to benefit from replacing some of their current narrow-body fleet with E2 jets.